There are many different styles of conferences that are run nationally and globally. Most are carefully organised and structured to suit those in charge. A timetable is created. The day begins with a keynote address after the welcome. Then depending on how big the conference is, educators and other stakeholders will decide which sessions to attend. Edcamps are an alternative to conferences. They are an “un-conference” whereby there is no organised schedule or keynote speakers. Participants on the day decide what they want to learn or talk about, thereby creating sessions based on preference. Workshops are facilitated by interested educators. So what would be my ideal conference? Firstly I would prefer an un-conference like Edcamp. Whilst I’m yet to attend one, I would prefer to have the sessions chosen by the participants. I want to see how other teachers use technology in their classroom, or implement different teaching pedagogies in their schools. To me, Edcamps seem to be more personal and hands-on. It allows teachers to actively participate in the sessions. A conference run only by teachers – not consultants who don’t know what is happening in the classroom. This allows educators to demonstrate what they are doing in their classrooms and other teachers can see the how it can fit into their own classrooms. Students are involved in the conference. Since the focus is on giving students a voice in the classroom to direct their own learning- why shouldn’t they also be given a voice at a teachers’ conference? Together with teachers, they can help to design learning programs that can be implemented in the classroom. The conference will allow them to tell teachers what they want and how they learn. Teachers and students can work together to create engaging units of work as well as learning environments that can be adapted to different learning styles. One where participants attend in school teams- each team is represented members of the principal class, the leadership team (e.g subject leaders/technology leaders), classroom teachers, students and parents. This allows all stakeholders to have a say in how students learn and what support is needed. Parents will also have a better understanding on changing teaching practices and how they can provide their children with the necessary support at home. The teams will then be responsible with sharing the learning with others at the school. Sessions at the conference are streamed via Google Hangouts or another platform. This will allow for a wider audience, especially since it is not possible for everyone to attend. Those who watch online can tweet their own questions/comments (with the conference hashtag) allowing them to contribute as well. YourEduStory Week 14: Describe your ideal conference: What is covered? Who is present? Get started on this journey, it’s fun to learn! As the new school year begins, there is the usual flurry to get everything ready before going back to work. Having enjoyed a wonderful break in Europe, it’s now time to get back to regular routines and schedules. My 1st day back on Twitter, I noticed the #YourEduStory challenge and decided it was a great way to start blogging again for the year. I enjoyed reflecting on my work last year and feel the need to continue the process this year. With new challenges, it will allow me to take at least an hour to think about what I am doing and why. The first challenge was “What is your “one word” that will inspire you in your classroom or school in 2015?” Immediately the word “believe” came to mind. It is a powerful word that often eludes my thoughts as well as my students. To believe in yourself is often hard to do and I notice it is a challenge not only amongst my students but for me as well. It can be easy to believe in others, to believe things that our families, religion, the government and any institution might tell us but we often forget to believe in ourselves. 1. To believe in myself and my abilities: this year I will be Head of English at my school. This is a new leadership role for me- one that I didn’t believe that I would get. I went for the interview in order to get more experience and I was surprisingly offered the role. Like any other leadership role, it comes with its own challenges. My first thought when my principal told me that I was successful was “Oh no, Oh no, what have I done? I don’t think I can do this!” A friend told me that if the interview panel didn’t believe that I was capable of being the English Leader, I wouldn’t have got the position. She told me that she had faith in me and knew that I could. She said that I needed to believe in myself- that I had the ability to be the subject leader. So this year I need to believe in myself- that I am capable of being a good leader. It doesn’t matter that I don’t know how to do everything in my role- I will learn as I go along. I have people who I can ask for help. This is my opportunity to help shape curriculum at school and to grow as a leader. It is a chance to learn new skills and to strengthen existing ones. As I tell my students- if you don’t try, how do you know you can’t do it. 2. To help my students believe in themselves: this will be an ongoing process. Most of my students come from refugee backgrounds and low income families. When they come into my class, many are aware that they are at a disadvantage and refuse to participate in activities for fear of embarrassment. They feel that they are unable to do the work and will give up. I tend to provide tasks that provide extra support for students with language difficulties or learning difficulties, providing several entry points in a unit of work. Getting them to believe in themselves is a year long journey. I encourage them to try- I will sit and work with them until they are comfortable with the task. It’s often easy to build up their self confidence one task at a time- each completed part makes them more willing to try the next. Having to do this with a whole class takes time and effort but it is always worth it. I tell them that it is important for them give everything a go- no matter how tough it might seem. If they need help, all they need to do is ask. To help them with this, I tell them that it’s okay to feel fear but they must use that fear to challenge themselves. So learning to believe in my own abilities and helping my students believe in themselves will be my goals for this year. I think it will be easier to help my students believe in themselves than it will be to convince myself that I am capable of being the English leader. I think it will be an interesting reflection in December to see what I have achieved. I joined Twitter and it’s made me think more about my teaching practice. It’s opened up a new world of PD for me along with educator blogs, Google Hangouts and communities. Pd in pajamas and in my own time! I’ve become passionate about Student voice in my classroom and take time to talk to my students about what they think about the class on a daily basis. I take more time to get student feedback and show them that I’m implementing their suggestions in the classroom. By reflecting regularly on my lessons and teaching practice in my blog posts, I am constantly thinking about the reasons why I adopt new technology or a different method of teaching. My development as a Leader is changing because of conversations with leaders at school- I know why I want to be a teacher and a leader. I’ve re-ignited my passion for teaching by connecting with educators outside my school- there is so much that I want to do. Implementing #PBL within my own Year 8 class has seen a dramatic improvement in student engagement and learning and I hope to do this with all my classes from Years 7-9. My Year 7 students’ class blog is up and running. Students are getting used to posting their work on the blog and even my teaching team is now more familiar with running the class blog. This will carry on next year as I hope to extend it to their other subjects as well. I became more comfortable with my role as the Domain Technology Leader as the year passed. Helping staff implement Blended learning lessons in their classroom was a challenge and at times it seemed as if there were too many obstacles. However staff from all 4 domain areas presented their Blended Learning Action Projects on the 10th of December 2014. It was a great success and it was wonderful to see other teachers come and learn from participants in a “speed-dating” session. Feedback from staff and participants was positive with many remarking that they had picked up ideas to implement in their own classrooms in 2015. Overall, this year has been a positive learning experience for me. I have become an enthusiastic learner and am constantly looking for new ideas to implement in the classroom. I constantly evaluate my teaching practice to ensure that it is the students who benefit from it. First of all, a well-deserved summer break during which I will be going to Europe for the first time- a dream come true. In 2015, I will no longer be a Domain Technology Leader. Instead I will be the English Learning Leader- a new role for me with many new responsibilities. I’m sad to give up my tech role but I look forward to new challenges. I have also been accepted into Bastow’s 2015 Emerging Leaders’ Program – this will help me further develop my leadership skills and hopefully will help me become more confident in my role as a leader at school. I will continue to learn from Twitter, blogs and all the great educators out there. I’ve already downloaded e-books on to my Kindle to read whilst I’m on long plane journeys. I’m looking forward to reading “Teach like a PIRATE”, “Digital Leadership” and many others. I’m looking forward to learning from my students and working with them again in 2015. I have been using PBL units in my Year 7 and 8 Humanities class during Terms 3 and 4. I have found them to be really effective. My Year 8 students enjoy it because it allows them to choose how they want to learn. As they’ve told me quite often “It’s good when the teachers don’t stand in front of the whiteboard talking to us for the entire lesson”. It allows them to ask for help when they need it. Some groups will require more teacher support and that’s ok. I like my PBL units because it allows my students to work at their ability- it’s not the same information delivered to them. They have different entry and exit points and I try to ensure that they cover the basic skills needed for that unit. Collaboration: Students learn to work in groups to complete the tasks. In our projects we had a mixture of student chosen groups as well as mixed ability groups chosen by the teachers. This enabled our students to develop their ability to work with a variety of students who have different learning capabilities. I often saw advanced students helping our EAL students with completing tasks and learning how to share the work based on ability. Issues arose, but with the help of teachers, they learnt how to talk about it in their group in order to resolve the problem. Time Organisation: Most of our PBL projects were limited to 3 weeks in which students completed their work. Students had to complete a plan that would help them with time management. Often this plan was abandoned along the journey and the last week would see a flurry of activity as students rushed about completing their projects. The News Reports project on Sustainability saw students suddenly realise that they were running out of time as the filming took them a lot longer than they expected. They had spent more time researching their topics and had left just half a week to film their reports as well as to edit their videos. Feedback from students showed that they felt they needed to work on their time organisation skills a lot more, especially when working in groups. Learning how to create questions for research: In our PBL projects, students had to come up with a list of questions that would guide their learning. In order for them to ask a variety of questions, teachers ran a “toolbox” lesson on the different types of questions they can ask. Students started to develop questions that were beyond the basic “recall” style of questions. This enabled them to delve more deeply into their topic. Self-direction: One of the key skills that I have seen my students develop is their ability to self-direct themselves. Yes, whilst at times they tend to get distracted, I’ve noticed more and more that my Year 8s especially are focusing more on their work. Many have told me that they like being able to work by themselves and choose how they learn. They make the decisions on the content they want to learn in a PBL unit and enjoy exploring different aspects of the topic. With my EAL students and High Needs Learners, I provide them with more support. In a current unit on Rainforests, I sat down with a group of 6 EAL students and asked them what they wanted to learn about. They chose Australian rainforests and together we worked out a list of 10 questions for them to research about rainforests in their chosen state. They made the decisions and I helped them with writing out the questions. It is amazing to see the boys working more independently each lesson and staying focused on their work. As a teacher, the PBL units have given me the opportunity to learn more about my students and the way they learn. By going round to different groups, it allows me to talk to them about their learning. They share what they are learning with me and we often get into discussions about the topic. My students like this way of learning- it teaches them to be independent learners and I find that they are more engaged in their learning than if I was standing in front of the class and teaching them. On days when they are struggling to focus on their work, it can be a challenge to redirect their attention but it is easier for them to get back on task when they are doing a PBL unit. It allows my more independent learners to delve more deeply into their topic and I will often challenge them to extend themselves further and give them further areas to investigate. The dependent learners work at their own pace, seeking support more regularly whilst at the same time extending their capabilities without them realising it. PBL units have allowed me to tailor the learning to suit my students’ needs and address the feedback that they give me. They are more vocal now about how they want to learn because they know that I will implement in the classroom whilst at the same time teaching them the required skills. It is interesting to note that they often tell me that it’s good that I don’t “teach” them – by that they mean that I don’t stand in front of them and talk for 75 minutes. I enjoy these units because it allows me to focus on individual student needs and to provide 1:1 support to them based on the task. Since Term 3, I have been making a conscious effort to use “Student Voice” in my Year 8 class. It started with a simple game of Hide and Seek and has changed my relationship with the students. I have taught these students since Year 7 and I have noticed the changes in the way they interact with me. In order to facilitate these changes, I’ve had to re-think how I interacted with them. I also had the support of my team to allow students to be more vocal in their learning. In reviewing the PBL unit on the Black Death, I asked students to complete an evaluation form. This was the first time they had to choose how they wanted to learn and complete their own tasks and I was interested in hearing their opinions. Student 5 has been the one responsible for the increased use of student voice in my class. Since our conversation in term 3, he has become quite vocal about how he wants to learn. He’s realised that I am interested in his ideas and opinions and am willing to implement them in my class. Since then I have seen a remarkable change in his behaviour. He is more engaged in his learning. He often assists me in getting the class to be quite, enjoys doing marking the roll for me and constantly volunteers his ideas in class discussions. He still gets distracted at times but out of my class of 42 students, he has made the most significant progress. He works harder to complete his work and will readily admit when he is struggling. 12 months ago, he would refuse help, get distracted or distract others and his work would rarely be completed. Just by giving him a voice in the class has changed his behaviour in my subjects. The other students respect him and follow his lead. “Student voice” is a necessity: I make a more conscious effort to ask the students for feedback on the lessons. It helps me get to know their learning styles better. Learning space: I try to be more open-minded in letting the students choose their learning area and space (some choose to work at tables, others on couches with the rest scattered on the floor). Groupings: I am more flexible in allowing students to choose who they want to work with. Some like working independently whilst others work better in groups. I don’t have to be worried that they won’t work. Trust and Respect: It is a challenge to win the trust and respect of all students in a class. By allowing them to voice their opinions and by implementing it in my classroom, I have gained their respect and trust. They are more open about themselves, they are happier in the classroom and I’m starting to see increased levels of engagement in their learning. It is now my challenge to use Student voice more in my Year 7 and Year 9 classes. With them it will take a while as I don’t know them as well as the Year 8s (who I’ve taught for nearly 2 years in a row). However having noticed the changes in the Year 8s, it is imperative that my teaching team and I focus on it, as it will improve the students’ engagement in their own learning as well as allowing us to help them learn in a way that suits them. 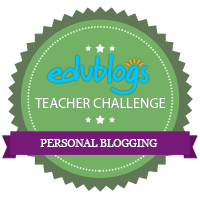 This post is written as part of the #blogsync challenge for Connected Educator month.